The veil is finally being lifted on Studio Ghibli‘s latest anime feature. The title song and lead role of “Gedo Senki” are performed by newcomer Teshima Aoi (18). Since February, previews shown at movie theaters nationwide have featured only the song and text, with no mention of who was singing. The studio planned to keep everything under wraps until the official release in July, but was overwhelmed by the number of requests from fans wanting more information. From today, a TV commercial tie-up with Asahi Soft Drinks will feature the song and is the first visual glimpse at the movie and its star. Teshima is described as a tall 18-year old beauty from Fukuoka who is a fan of Louis Armstrong, Fred Astaire and Billy Holliday. She did her recording alone in the studio, buts says “When I realize I’ll be standing on stage with (co-stars) Okada Junichi (of pop group V6) and Sugawara Bunta, I get very nervous!” Studio Ghibli’s summer releases have continually broken box office records, but the latest film marks the first time that studio founder Miyazaki Hayao (65) has handed the reins over to his son Goro (39). Goro originally said he’d never get involved in the world of anime and worked as a building design consultant. The closest he got to his father’s work was designing the Ghibli Museum in Mitaka, west of Tokyo. But the draw of the family business has proved too strong. His first venture is into a world of dragons and a tale that seeks to remind people of what has been lost in the world of today, based on the “Tales from Earthsea” fantasy novels. 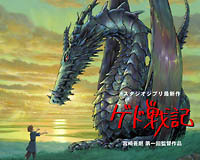 The final, 1236th cut of the film was completed on Saturday, according to the Studio Ghibli website. • Hip hop unit Teriyaki Boyz represented Japan at yesterday’s MTV Asia Awards show. Broadcast from Bangkok to an estimated 100 million homes across the continent, the show was the biggest exposure yet for the unit led by fashion designer Nigo (35). His “A Bathing Ape” brand, which enjoys huge street cred, is gaining increasing popularity across Asia. Naturally the band appeared on stage wearing BAPE t-shirts and launched into a version of “Heartbreaker”, their debut single which was produced by popular French duo Daft Punk. The show was hosted by Kelly Rowland, formerly of Destiny’s Child. • Morning Musume members Konno Asami (19) and Ogawa Makoto 818) have announced that they will be “graduating” from the pop group. The announcement was made yesterday during the final show of their national tour at the Saitama Super Arena. Konno, who celebrated her birthday yesterday, told fans that she is going to go to college. Ogawa plans to study abroad. The group’s 30th single, unnamed but due for release on June 21, will be the pair’s last.